It never rains but when it pours! yesterday late afternoon I was going to check the security camera recordings to look for a thief in the area, when it froze and then blank, so we contacted the lad who installed the system, and asked for an emergency call out. Sure enough, he came an hour or two later, and it appears there is a problem with the firmware, or so he thinks, and it will have to go back to the factory to see if it can be repaired or not, in the mean time, he was going to swap the hard drive into a spare at the shop, so we could continue using the system. Whilst he was here we asked for a quote to change the camera overlooking the road, for a better quality camera, which he gave us, but he is not sure if it will work with this DVR as it is 4K, so he will try it out in the shop, and then we will make a decision. The idea being to be able to read number plates, and identify people, with the increased problems here. We arranged to go and collect the replacement at 10am this morning, but when I turned my phone on, there was a message saying that he had to leave early, and would contact us on his return, whenever that will be. This morning. I have almost finished phase one of the Desk project, I cut and fitted the drawer faces, using pocket hole joints. I then fitted blocks above each draw to stop them tipping when they are opened, I have used wooden slides, rather than metal ones, like I did on the bedside tables, I can make my own, and it's cheaper. I thought about making some wooden handles, or cutting a slot in the top of each drawer to open them, but decided I will buy some from Homecenter, probably tomorrow. 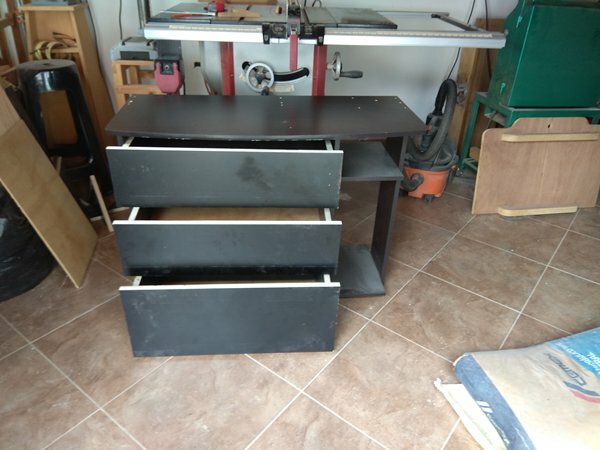 I need to go and buy some black spray paint, along with laquer or polyurethane for surface protection, and some more 1/4" plywood for the second unit. 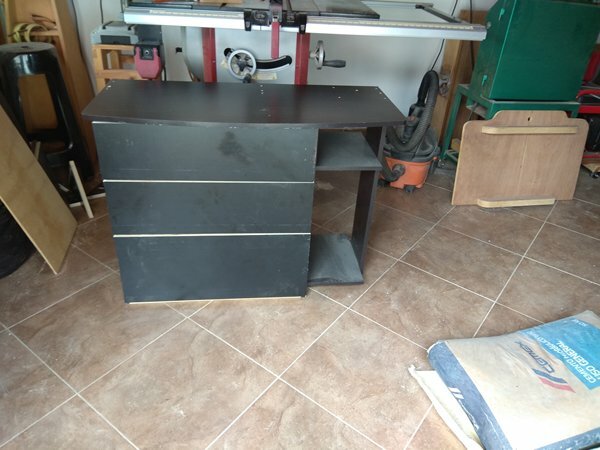 This will be Marcela's storage, and the support for the narrower wing of the desk. Once I have finished this one totally, I will move on to phase two, the second desk. It will be a week or two, before it is totally finished, because I need to repaint the office before installing the new desk. I should get a fair bit done during the next week, as I will be 'Home Alone' for most of it, as Marcela is working all hours, ready for Mother's Day, if last year was anything to go by, she should do well in the shop. One problem I have overlooked, and just thought of whilst typing away, is the cable management holes, fortunately the drawers do not go to the very back of the unit, so there maybe room to drill through, I'll have to see.